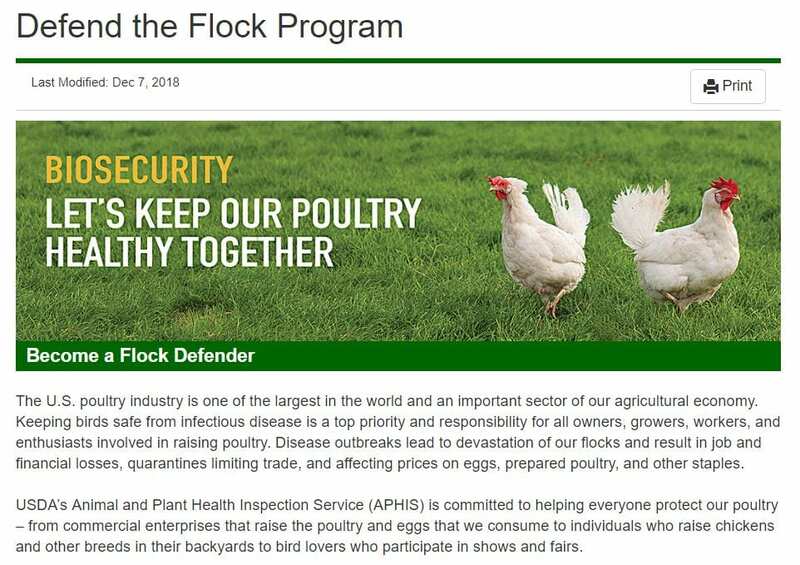 USDA/APHIS has increased the amount of materials for use for increasing outreach and awareness regarding Biosecurity for Backyard Poultry with the Defend The Flock program. A new fact sheet has been added to Ohioline to assist backyard poultry producers navigate the challenges of keeping their flock safe and healthy during cold weather. 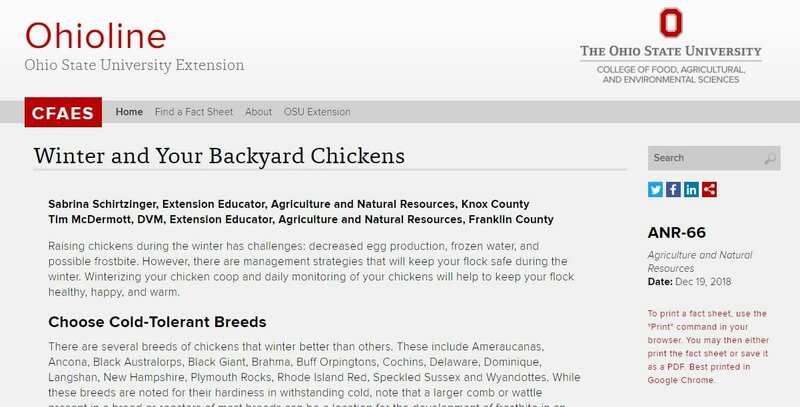 Click Here to view and print Winter and Your Backyard Chickens on Ohioline. There are various reasons people raise chickens: for eggs, meat, show and exhibition or simply to enjoy caring for and watching chicks grow. For some, raising chickens is a hobby while others see it as a sustainable part of living. This fact sheet will explore characteristics of chicken breeds to help select the right breed for you. 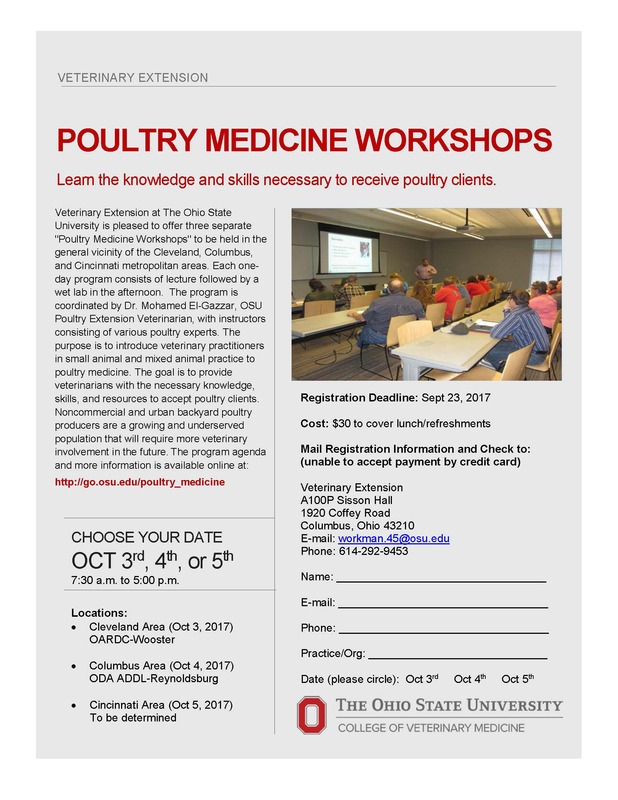 Veterinary Extension at The Ohio State University is pleased to offer three separate “Poultry Medicine Workshops” to be held in in the general vicinity of the Cleveland, Columbus, and Cincinnati metropolitan areas . Each one-day program consists of lecture followed by a wet lab in the afternoon. The program is coordinated by Dr. Mohamed El-Gazzar, OSU Poultry Extension Veterinarian, with instructors consisting of various poultry experts. The purpose is to introduce veterinary practitioners in small animal and mixed animal practice to poultry medicine. The goal is to provide veterinarians with the necessary knowledge, skills, and resources to accept poultry clients. Noncommercial and urban backyard poultry producers are a growing and underserved population that will continue to require more veterinary involvement in the future. 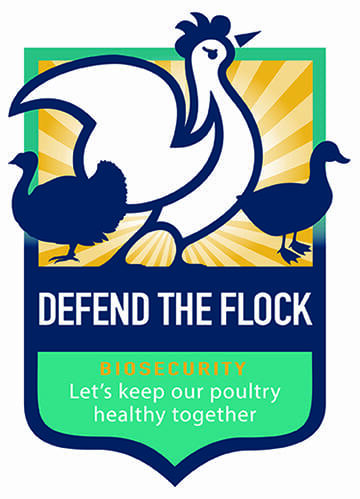 When it comes to disease threats, you are your flock’s best protection. Biosecurity – practiced carefully and regularly — is key to protecting backyard birds from infectious disease carried to and from farms, backyards or aviaries, by people, animals, equipment or vehicles. Wild birds, particularly waterfowl like ducks and geese, can carry diseases such as Highly Pathogenic Avian Influenza (HPAI), among others. With spring migration underway, bird owners should be aware of the increased threats and take steps to limit spread of germs and disease by following good biosecurity practices at all times. Follow and share your biosecurity tips and practices using #biosecurity. Use or customize these sample Facebook posts to increase awareness of the importance of biosecurity practices during migratory season. Share the sample tweets on Twitter to get your followers involved with #biosecurity. High Path Avian Influenza has been in the news lately as outbreaks have occurred both in the United States and abroad. The United States Department of Agriculture (USDA) Animal and Plant Health Inspection Service (APHIS) announced on March 5, 2017 the detection of H7 Highly Pathogenic Avian Influenza (HPAI) in the state of Tennessee. The affected flock is a Broiler Breeder, 30 to 45 weeks of age, located on an 8 house farm (~10,000 birds in each house) in Lincoln County, located in South Central Tennessee, 2 miles from Alabama border. On Thursday March 2nd, mortality increased to 132 dead in one house. On Friday March 4th, mortality jumped up to 500. Positive samples from only one house out of 8 were determined to be H7 by Tennessee NAHLN and confirmed by National Veterinary Services Laboratories (NVSL) late Saturday. By Sunday March 6th afternoon, all houses had been depopulated and onsite burial operations were underway. A control zone of 10 miles (not 10 Kilometers) was immediately started and the initial surveillance of commercial and noncommercial poultry premises within this zone (which extends into the state of Alabama) is near completion. No further positive samples within the zone have been detected thus far. On March 7th, USDA’s NVSL confirmed that the complete subtype of the Tennessee virus is H7N9 based on the full genome sequence of all 8 influenza genomic segments. They also emphasized that based on the sequence the virus is of North American (NA) lineage and “is NOT the same as the China H7N9 virus that has impacted poultry and infected humans in Asia”. As NVSL explains, while the Tennessee and China viruses have the same designated subtype, they belong to genetically distinct lineages. What is referred to as the North American lineage is the genetic lineage that can be found in migratory wild birds of North America. Wild birds are suspected to be the source of this outbreak as well. While there is no identified direct link between wild birds and this particular farm in Tennessee so far, the H7 NA lineage was detected in wild birds multiple times this year. We don’t know how this virus could have jumped from wild to domestic birds, but it is important to note that Low Pathogenic Avian Influenza (LPAI) can transform into HPAI after they circulate in domestic poultry. On March 9th, the Tennessee State Veterinarian confirmed another H7N9 influenza case in a commercial chicken breeder flock in Giles County, Tennessee, which is the county immediately to the east of Lincoln County, where the initial H7N9 virus was detected. However, this case in Giles County is Low Pathogenic Influenza (LPAI). No mortality or clinical signs were reported and it was detected during a routing surveillance testing. On March 14th, Alabama announced investigation of 3 potential cases of H7 in Jackson, Lauderdale, and Madison counties in north Alabama, all low pathogenic, one in a commercial breeder and two in noncommercial flocks. Latter on March 16th a second case of H7 HPAI was confirmed in another broiler breeder flock just one mile away from the index case in Tennessee with high mortality. On March 18th a commercial breeder flock was confirmed to be H7 positive in Christian County, Kentucky with no clinical signs suggesting that it is low pathogenic. Then two more cases were confirmed in Pickens and Madison counties in Alabama on March 22nd. And finally on March 22nd a flock of commercial poultry in Cullman County has tested positive for H7 with no clinical signs. All in all, we had two highly pathogenic H7 cases, both in Tennessee, 1 mile apart. Also, we had several low pathogenic H7 cases in commercial and noncommercial poultry in Tennessee, Alabama, and Kentucky, in addition to one detection of H7 in wild birds in Kentucky. These findings highly suggest that we have a low pathogenic virus given the chance to circulate in domestic poultry until it was transformed into a highly pathogenic virus. This is similar to the Indiana H7 HPAI outbreak of last year. Meanwhile, another reportable influenza virus was detected in a commercial turkey flock in the state of Wisconsin. A 6-house farm containing 84,000 market turkey toms with 3 houses at 16 weeks of age and 3 houses at 6 weeks of age was confirmed to be positive for H5N2 North American Lineage virus, which is different from the 2015 virus. This virus was classified as LPAI, mild signs of depression prompted the testing of the flock. But because it’s an H5 virus, and has the capacity to transform into a HPAI, it is reportable to international organizations. This flock will not be depopulated, it will be sent to the processing plant through a controlled marketing process. The flock will be tested using PCR weekly to ensure the cessation of viral shedding before they are moved to the processing plant. For the second year in a row, an influenza virus was able to jump from wild birds to a commercial poultry population and turn into HPAI. In our view, this points to a significant weakness in our influenza surveillance systems. Our inability to detect these viruses while they are circulating in domestic poultry, allowing them to blindside us and showing as HPAI outbreaks, invites a revision to our surveillance methodology. A review of “Testing Protocols for Disease Surveillance in Poultry” was written last year (http://vet.osu.edu/sites/vet.osu.edu/files/documents/extension/Vol%2042%20No%205.pdf) detailing the decision making process as it relates to improving surveillance methodology. A bird flu outbreak that has led officials to euthanize more than 200,000 animals in three Southern states already is the nation’s worst since 2015 and new cases are still popping up, an expert said Wednesday. Agriculture officials are trying to limit the damage, but it’s unclear whether quarantines, transportation bans and mass killings will stop the spread, said Joseph Hess, a poultry science professor at Auburn University. The disease was first confirmed in southern Tennessee earlier this month and has since been detected in northern Alabama and western Kentucky. 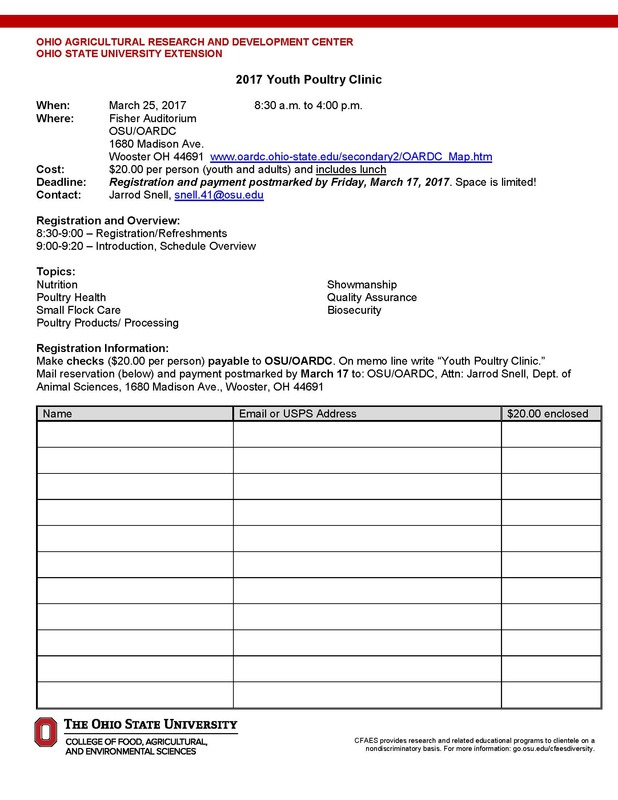 An OSU Youth Poultry Workshop will be held on Saturday, April 22 at the OSU Columbus campus Animal Sciences Building. A link to the flyer is posted at www.poultry.osu.edu on the Calendar of Events page. The cost is $10.00 per person if postmarked by April 10, and $20.00 per person same-day registration. Participants will learn how to evaluate and select birds for meat and eggs, how to quality grade meat carcasses and eggs, basic handling and showmanship techniques, as well as prepare for the Ohio State Fair youth poultry events – judging contest, skillathon, and avian bowl. It has been a little bit over 2 years since the beginning of the largest Highly Pathogenic Avian Influenza (HPAI) outbreak in North America (NA). The virus that caused such outbreak was genetically identified to be a mix between North American and Eurasian Avian Influenza (AI) viruses. Wild migratory birds are thought to play a prominent role in bringing that virus to NA. While the last case of commercial poultry from that outbreak was reported in late spring of 2015, AI continues to be a threat to the poultry population (commercial and noncommercial) in NA. The clearest evidence of that threat materialized in another HPAI outbreak in January of 2016 that affected the commercial poultry industry. Different from 2015 outbreak, the 2016 outbreak evolved from a purely NA virus. It also seems that the Eurasian virus did not disappear from NA; as it has been isolated from wild mallard ducks in two different occasions from two different locations (Alaska, August and Montana, December) in 2016. The United States Department of Agriculture’s (USDA) Animal and Plant Health Inspection Service (APHIS) has detected the presence of Eurasian/North American reassortant H5N2 avian influenza in a wild mallard duck in Fergus County, Montana. No illness or mortalities in domestic poultry in the U.S. have been detected.